Congratulations MSSE on your 100th Year Anniversary! The Divine Mercy Novena begins on April 19th, and will be concluded on Divine Mercy Sunday, April 28th. The Divine Mercy Chaplet will be prayed at 3:00pm in the church every weekday during Lent (Monday through Friday). It began on Ash Wednesday, March 6th, and will continue through Good Friday, April 19th. The Chaplet is a prayer of atonement and petition for mercy while reflecting on the passion of Jesus. All are welcome to join us in this powerful devotion as we prepare for Holy Week and Easter Sunday. For more information contact Madelyn Walker. Earlier this month his superior, Abbot Eugene Hayes, in formed us that the Abbot General of the Norbertine Order has named Fr. Martin Benzoni as Rector of the Norbertine College in Rome. Fr. Martin will complete his ministry here at Mary Star at the end of June and take up his new responsibilities after the middle of August. We will have the opportunity to say farewell at the end of June. We wish him all God’s blessings and promise him our prayers as he begins this new and challenging endeavor. On Saturday, May 4, 2019 the Italian Catholic Federation is celebrating the Feast of the Madonna dell’Arco at the 5:15 P.M. mass. The Italian Community has long been devoted to the Madonna dell’Arco. The name of the Madonna dell’Arco originates from an area where there were aqueducts with supporting columns and arches (arco) built during the Roman Empire. On one of these columns a devoted artist painted the image of the Blessed Virgin and Child. Many centuries later, youths were playing bocce ball near this column. After a clumsy throw, the ball of one of the players hit a tree that shaded the sacred shrine. The youth, blinded by anger, retrieved the ball and threw it against the image of Our Lady, hitting her on the right cheek. To the shock of all those present, the cheek was seen bleeding, as if it were of real flesh. Centuries later this original image was cut away from the column and placed in the Church Sanctuary in Naples, Italy. Many miracles were recorded since then and in March 1675 for about a month, the image of Our Lady was seen surrounded by stars, while the right cheek appeared red with blood. A mosaic of the Madonna dell’Arco was donated to Mary Star by Mr. Joseph Scotti and dedicated on April 17, 2016. It was placed in the Shrine of Saint John Joseph of the Cross. Please join us to celebrate the Feast Day of Our Lady of the Arch. A procession will start from the back of the church with the portrait of the Madonna along with Mary Star societies and their banners. All are welcome to bring flowers from the garden and place them in front of the Madonna dell’Arco. It is on May 5th-7th, 2019 for two nights, three days at the Riverside Hotel and Casino. Price $125.00 per person double occupancy and $160.00 single occupancy. Includes 3 free buffets. For reservations call Pauline Iacono at 310-832- 0563. Proceeds of both trips to benefit I.C.F Branch 115 adopted seminarian program and various charities. Mantle Young Adults April Events! If you are a young adult ages 18-35 come join us Sundays at the Convent Chapel at 1:30pm. Show up on time because sometimes we carpool out. Follow us on instagram for weekly posts and information at mantle_of_the_mediatrix_yag (www.instagram.com, mantle_of_the_mediatrix_yag/). Questions, concerns, or interested to help out in any way? Contact Angela at asunjara@yahoo.com. Please click on this link to view their Calendar of Events for 2018-2019. Click on the image thumbnails to view their full-size versions. Let’s give thanks to the Lord for all he has provided us with. If not that, let’s ask for the grace and guidance to find a solution to a difficult problem. Or pray for our family’s health and well-being. There are countless reasons to join us, in prayer, in the Adoration Chapel, praying before the Blessed Sacrament. Monday Noon - 1 p.m. & 6 - 7p.m. Saturday 7 - 8 p.m.
“Almighty Father, help me to show gratitude to You for all the good things You have done for me. Let me also be grateful to all those who help me on my earthly pilgrimage to Your heavenly Kingdom.” Every Day is a Gift. Thank you for your consideration. Every Friday during Lent after the 5:15 pm Mass. Held by the Knights Of Columbus #1740, Angel&apos;s Gate. Starting March 8th, and every Friday through April 12th. Proceeds Benefit CHRISTIAN CARE MINISTRY. Stations Of Cross follow at 7 pm in the Church. We extend an invitation to all who would like to join our Lectio Divina group on Tuesday, April 2nd in the Convent chapel from 9:00am – 10:00 am. Lectio Divina is a prayerful reflection on a Scripture passage. The text for each meeting is the gospel from the previous Sunday. On April 2nd we will use the story of the Prodigal Son: Luke 15: 1-3; 11-32. There is a growing interest in this ancient form of prayer and it will be to our benefit if we open ourselves to it. Hoping to see many of you at the next session. A blessed and holy Lent to all. For more information, contact Sister Loretto. Mary Star Elementary School held a "Star for a Day" Kindergarten experience on Tuesday, March 5th. Please click on this link to view the flyer. The High School is now accepting applications for the 2019-2020 School Year. Please visit www.marystarhigh.com or call 310-547-1138 for information and applications. Registration for incoming Freshmen will be by appointment only on Thursday, March 14th. The Mass Intention Book for 2018-2019 opened on Thursday November 8, 2018. To schedule a Mass Intention, please come to the parish office between 9a.m.- 12p.m. This year (same as last year) the Mass Intentions will be scheduled on a first come, first serve basis and must be scheduled in person. In order to accommodate everyone, there is a limit of 2 Masses per family only. For St. Vincent de Paul pickup of donations call 800- 974-3571. For car donations (a tax deduction & free pickup) call 800-974-3571. Hereafter on Sundays we will pray the Holy Rosary before the each mass. It will be conducted by the priest, the one who offers the mass. Hence, 15 minutes before each mass, kindly be present in the church. The Thursday Morning Bible Study at Mary Star of the Sea would like to invite you to join us as we continue our study of the Gospel of St. Matthew, combining lectio divina (an ancient form of prayer in the church) with traditional Bible study. As the Word of God moves more deeply in us, we take the beautiful lessons we’ve learned into our lives. For more information, please contact Louise Garcia at 310-831-9839. Mary Star High School held a Life Chain rally on Gaffey St. at 9th St. on Sunday, October 7th. Please click on this link to see some photos of the event. Please read the letter from Archbishop Gomez regarding the recent revelations in the news. Please click on this link to view the letter in English. Please click on this link to view the letter in Spanish. Confirmation sessions will be offered at the MSHS campus in 2018-2019. This program is for those students entering the 10th grade and above. The deadline to register is September 7, 2018. The parent session is September 10, 2018. The first student session is September 17, 2018. Sessions are twice a month on Monday evenings from 7pm - 8:30pm in the school gymnasium. Forms can be found on this web site under the "Liturgy & Sacraments" menu, or by clicking on this link. Sessions will be held at Mary Star High School, located at 2500 North Taper Avenue, San Pedro, 90731. Please contact Michelle Downes in the church Rectory at (310) 833-3541 ext. 200 if you have any questions, to turn in forms, or to submit payment. Please extend a warm San Pedro welcome to Fr. Diego Menniti, a priest of the Archdiocese of Catanzaro- Squillace in Calabria, Italy. Since his ordination on June 27, 2015, Fr. Menniti has served as a parochial vicar in the parish of St. Barbara in the city of Catanzaro, as Vice-Rector in the Diocesan High School Seminary and Chaplain at the "Villa del Sole" Cardiological and Orthopedic clinic. In 2016 he obtained his licentiate in Moral-Social Theology. For the academic year 2017-2018, Fr. Menniti appointed in charge of the Preparatory year at the Pontifical Regional Seminary "St Pius X" of Catanzaro. He started his postgraduate studies (M.A. in Bioethics) at Loyola Marymount University at the beginning of 2018. Fr. Diego will be a student-priest in residence here at Mary Star of the Sea Church, and also helping with ministerial needs of the parish to experience pastoral work in the Archdiocese. Benvenuto! Registration is now open for the 2018-2019 school year for 3-5 year olds who are fully pottie trained. Our preschool program is year round, part– and full– time. Come over and take a tour! No appointments necessary! We have a safe environment with qualified, caring teachers who instruct faith development and age appropriate hands-on activities in Creative Art, Kindergarten Readiness, Math Concepts, Science Exploration, Multicultural Exposure, Music/Movement Activities, Dramatic Play, Outdoor Activities and Character Development. For more information about our preschool program, please call (310) 833-3541 Ext. 228 and ask for Beth Castagnola (Director), email at MaryStarPreschool@gmail.com or visit: www.MaryStarElementary.com. Our 71st Annual Fiesta Queen and her Court. Top row: Fr. M. Harrigan. Bottom row, from left to right: Karla Rocha, 2018 Fiesta Queen Sofia Amalfitano, our 2017 Former Fiesta Queen Gina Duhovic, and Lauren Mitchell. For more Fiesta info please click on this link. Did you attend the 2017 Fiesta? Chances are Nick Vilicich took a picture of you having a great time! You can call the Rectory at (310) 833-3541 ext. 203 to get Fiesta Photo information. Future: Go to California State University to be a Pediatric Nurse. Please join us at 5:00 p.m. in the church for a 10 minute Rosary on Monday, Tuesday, Thursday and Friday. Come and Pray With Us. Thank You and Blessings from the 5:00 p.m. "Weekday" Evening Prayer Team. Volunteers are needed to distribute Holy Communion to Catholic patients at San Pedro Little Company of Mary Hospital. If you can participate in this ministry, please contact Maria Andrews, Spiritual Care Office (310) 241- 4365 or maria.andrews@providence.org. Are you part of a family looking to chant the Mass together? Would you like to expose children to what "singing the Mass" is? The Mary Star Elementary and the adult scholars are joining on the first Sunday of the month to chant the Mass both in English and Latin. To join and sing along (all ages and skills welcome! ): meet us at 4:15PM in the Chapel of the convent, walk on parking lot to the East of the Church entrance. Mass starts at 5:15PM. 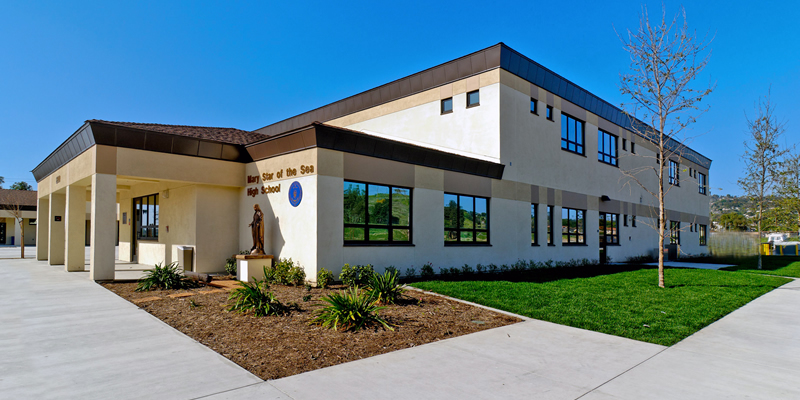 Mary Star of the Sea High School was recognized as a Catholic Education Honor Roll School. The national Honor Roll program is directed by the Cardinal Newman Society and has recognized only 6 highperforming Catholic high schools nationwide in 2017. Mary Star engaged in a thorough internal and external review of its comprehensive program offerings before being awarded this status. It has received specific recognition for its strong integration of Catholic identity throughout its efforts, including the integrity of its mission, and the strength of its community and rich spiritual life. The Honor Roll also recognized the school’s efforts at integral formation of the minds, bodies, and spirits of its students as well as its comprehensive academic program which seeks to instill a Christian vision of the world and human wisdom and culture. “The Honor Roll is a helpful tool for families and benefactors in recognizing the quality of a Catholic high school,” said Patrick J. Reilly, president of The Cardinal Newman Society. “It is external validation that a school is both focused and successful in meeting the high calling of Catholic schools to serve the well-being and salvation of students and to serve the common good.” Dr. Denise Donohue, coordinator of the Honor Roll, stated, “We are very pleased to have Mary Star High School join in the nationally recognized ranks of excellence; this is a select group. The school has well demonstrated they are successful in meeting the key principles that guide Catholic education.” Mary Star’s Principal Ms. Rita Dever remarked, “It is great affirmation for Mary Star High School to be recognized by the Catholic Education Honor Roll. This distinction confirms our commitment to the mission of Catholic education. I applaud the leadership, administration, students, parents, teachers, and staff for their hard work in assuring a strong Catholic identity permeates all that we do in preparing our students to be future leaders in both society and the Church.” More information on Mary Star High School is available at www.marystarhigh.com. More information on the Catholic Education Honor Roll is available at cardinalnewmansociety.org. At 6:00 PM every Wednesday there is a Holy Hour in the church. It begins with exposition of The Blessed Sacrament. Within the hour, there is a rosary with beautiful meditations, time for silent reflection, and the Chaplet of Divine Mercy. The Holy Hour concludes with Benediction. Please come and spend one hour with Jesus. This is a special time of abundant blessings for all! Adult Faith Formation session will take place on Tuesday, November 14th at 7:00pm in church. The topic is Death and Dying: facing the end. The topic is appropriate especially during this month of November when we are invited to pray for all our loved ones who have gone before us. This session is for the parents of children who are preparing for First Holy Communion. All are welcome to attend. If you need further information on the above program, please call Sister Mary or Lorena at (310) 833- 3541, ext 221, 222. St. Margaret Mary Parish in Lomita offers Catholic faith formation for children and others with special needs (e.g., those who are moderately or severely disabled physically, intellectually, or in other ways, such as those with Down Syndrome, ADHD, autism, and vision and hearing problems). The faith formation is tailored to their needs and prepares them to receive the sacraments, including First Holy Communion. The sessions are held on Saturday mornings at 10 a.m. Volunteers also are needed to help with this faith formation (training will be provided). For more information or to volunteer, please call St. Margaret Mary Parish at (310) 326-3364. The CREIGHTON MODEL FertilityCare System (CrMS) is available to women who want to understand their menstrual and fertility cycles. With a few minutes of daily observations and the NaProTRACKING of certain “biomarkers”, the CrMS provides a woman a greater insight into the function of her body. Married couples can use this system to naturally plan their families and strengthen their relationships. Using fertile days to achieve pregnancy and infertile days to avoid pregnancy, the CrMS is a safe and healthy alternative to artificial contraception, sterilization, and IVF/IUI that honors the dignity of life and love. Working with our excellent network of CrMS medical consultants, we also provide comprehensive service to women who are dealing with a variety of reproductive health issues, including infertility. Based on 30 years of scientific research and faithful to Pope Paul VI’s encyclical Humanae Vitae, the CrMS is not only highly reliable but also morally acceptable. Free monthly CrMS Introductory Sessions are held every 3rd Tuesday at 7:30pm in the Parish Center. To pre-register, please contact Marianne Dyogi, CFCP at (714) 803-4775 or msdyogi@gmail.com. More information can be found at stellamarisfertilitycare.com. Spread the good news that every woman deserves to know! Our 70th Annual Fiesta Queen and her Court. From top left: Tatiana Lopez, Annabel Madrigal, Julissa Perdomo, Lorenza D&apos;Orio, Fr. Harrigan, our 2016 Former Fiesta Queen: Rose Amalfitano, and our new 2017 Fiesta Queen Gina Duhovic. The Liturgy of the Hours is available at 5:00 p.m. on Monday, Tuesday, Wednesday & Friday, in the Church right before the 5:15 p.m. Mass. Prayer is a Gift. Let’s Open it up Together! Please Join Us. Your Current Evening Prayer Leaders are as follows: Monday - Rene Mardesich; Tuesday - Shelly Chin; Wednesday - Elfida Soto; Friday– Louise Garcia. You are invited to join us on Tuesday evenings from 7:30 pm - 9:00 pm. in the Parish Center Chapel. We begin with praise and worship and continue with shared scripture and prayer for all those who are in need. It is a wonderful time to come together to praise Jesus, for all he is doing in our lives! "Where two or three are gathered in my name, I am in their midst" - Matt. 18 - For information call the rectory (310)833-3541 or Louise Garcia at (310)831-9839. As we conclude this season of Lent, we want to highlight By Your Side LA, a new ministry to offer healing to women and men affected by abortion. By Your Side is a comprehensive, bilingual ministry that includes a beautiful website, professional call center, trained lay Merciful Companions, and referrals to healing resources including sacraments, retreats, support groups, bible studies, mental health professionals, and more. We want to be by the side of each person journeying from pain following abortion to a new place of forgiveness and peace. We hope you will come to know that you are created out of love and for love. The abortion does not define you. That you can build a life deserving of the amazing person you are. We are here to listen. And we will be by your side. Visit ByYourSideLA.org for more information. Al entrar en esta temporada de Cuaresma, queremos resaltar a un ministerio nuevo, Contigo LA brinda apoyo a mujeres y hombres afectados por el aborto para lograr una sanación interior. Contigo LA es un Ministerio integral y bilingüe que incluye una hermosa página web, un centro de llamadas professional, Acompanates Misericordiosos (laicos capacitados). Además brinda informes a medios de sanación: sacramentos, retiros, grupos de apoyo, estudios bíblicos, acceso a profesionales de salud mental y mucho más. Queremos acompañar a cada persona en su jornada, del sufrimiento a un lugar de perdón y paz después de un aborto. Esperamos que llegues a saber que fuiste creado del amor para amar. El aborto no te define. Tu eres una persona extraordinaria y puedes crear una vida digna de ti. Estamos aquí para escucharte, estamos contigo. Para mayores informes visita ContigoLA.org. Have you ever thought about what unnatural birth control methods really do to your body? To your marriage? The Couple to Couple League has the answers and more. Attend a short course and learn a natural method of family planning that is safe, effective, and morally acceptable. Great for achieving as well as postponing pregnancy. A new course starts February 25th. For more information and registration contact Beth and Greg Gath at (562) 377-5877 or bethgath@gmail.com, or visit the Couple to Couple League&apos;s website www.ccli.org. The Daughters of Isabella August/September 2016 Newsletter has arrived. Please click on this link to view the August/September Newsletter. We will be starting again this Fall on Saturday, September 10th! Are you searching for a deeper relationship with God? Are you interested in developing your “interior” life? Do you want to better understand the Blessed Mother’s role in your faith journey? Our 69th Annual Fiesta Queen and her Court. 2016 Fiesta Queen Rose Amalfitano. Stella Maris Bookstore is looking for volunteers to sell on Sundays and Wednesdays. Hours scheduled are 2 1/2 on Sunday or 2 3/4 on Wednesday once or twice a month. Proceeds benefit Mary Star Elementary and High Schools. If you are interested, please email the bookstore at stellamaris@marystar.org or call the bookstore at 310-519-8661; leave a message and we will call you. Thank you, in advance, for your service. On Thursday, March 31st Ms. Rita Dever, Principal of Mary Star of the Sea High School, was honored at the San Pedro Chamber of Commerce’s Women’s History Month Reception. As one of five women celebrated that evening, she received several certificates of recognition including a Certificate of Congressional Recognition, California Legislative Assembly Certificate of Recognition, and State of California Senate Certificate of Recognition. Mary Star of the Sea High School has been selected to the National Football League’s Super Bowl High School Honor Roll. As part of the celebration for the 50th anniversary of the Super Bowl, the NFL is awarding high schools a commemorative Golden Football for every player or coach who was on an active Super Bowl roster. Tim Wrightman, Class of 1978, presented the commemorative Golden Football to Mary Star of the Sea High School on Tuesday, January 19th. Tim went on from MSHS to star at UCLA, where he played tight end. He then played for the Chicago Bears when they won the Super Bowl in 1985. Tim Wrightman presents a golden football to Principal Dever, Fr. Nicholas, and Fr. Harrigan. Gift cards for a wide variety of merchants are available for purchase (fee-free!) outside the church on Sundays from 8:00am to 11:45am. Please click on this link to view the MSHS Gift Card Merchant List. Our Christian Care is in need of volunteers to hand out lunches on Wednesdays, Thursdays, and Fridays from 11 am — 12:15 pm. For more information or if you are interested in lending a helping hand, please contact either Rick or Pat at (310) 832-7913. Please note, we have a NEW website manager. If you are a Parish community or group member who requires future changes/additions to your particular web page on our Parish website, please feel free to contact Michael Munn at MMunn@marystar.org. The Bookstore is located adjacent to the Parish Auditorium. We honor Mary Star of the Sea Elementary & High School scrip! We also have a variety of great Catholic items, for more information,please click here. Lent related booklets and Stations of the Cross pamphlets are now available! ​You can volunteer in the parish for as little as 4 hours per month in the Stella Maris Bookstore. No experiece necessary; we will train you. It's a great opportunity to interact with fellow parishioners. Please see Mary Reynolds or Perry Di Massa or call the boostore at (310) 519-8661 for more information. Thank you for prayerfully considering this minsitry to our parish and schools. Join Sister Loretto for Lectio Divina the first Tuesday of every month in the Convent Chapel. Lectio Divina is the reflective praying of Scripture. All are welcome. If you have not turned in your pledge envelopes, please fill them out and mail them in with your pledge. THANK YOU to Mary Star parishioners who have made pledges to this year’s Together in Mission campaign. For those who have pledged in the past, but have not had the chance to make a gift, a letter is on its way to your house. If you have never made a gift to the campaign you can fins a pledge card in the parish and return it to the parish office. You can also make a gift by visiting ourmissionla.org/give, or by texting the word BELIGHT to 41444. I am confident that each of you will prayerfully consider sharing the abundant gifts that God has shared with each of us.